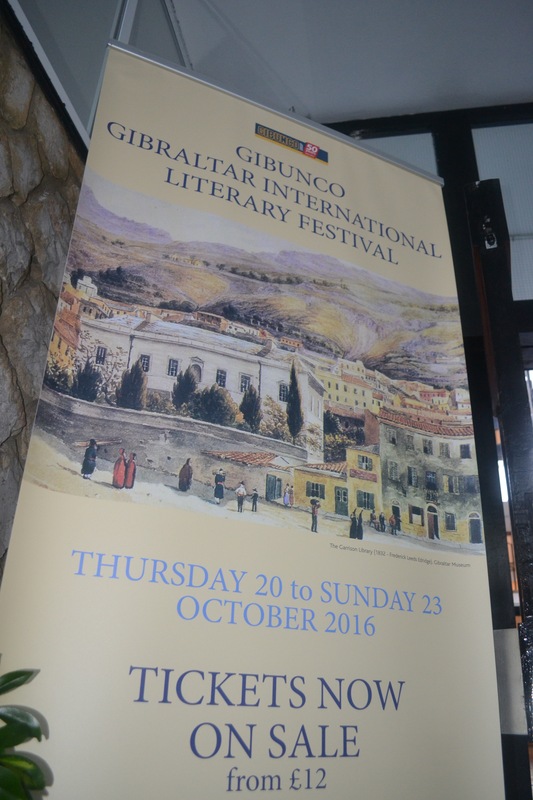 This time last week, the sixth Gibunco Gibraltar Literary Festival was underway and there was a palpable buzz about town. This has got to be my favourite event in the Gibraltar social calendar, when local and international speakers come to the Rock to speak about their books, their lives and so much more. To have an event like this, just a short bus ride or walk from my home is a luxury I treasure and I do my best to attend every year – this one is my fifth. 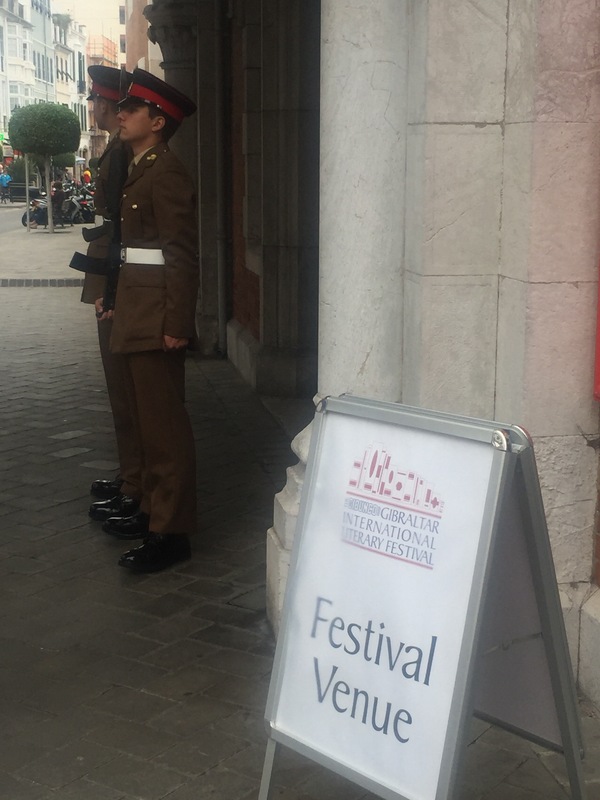 Here’s my experiences from this year’s festival…. First thing last Thursday morning I made my way to the John Mackintosh Hall for a talk by local biologist, Dr Alex Menez. He’s written a book called Almost Homo Calpicus about Gibraltar 1, the Neanderthal skull which was found in Forbes Quarry in Gibraltar the nineteenth century. In his talk he detailed what happened to the skull after it’s first presentation to the Gibraltar Scientific Society back in 1848. This very famous and important fossil, which was actually discovered before the ‘Neanderthal skull’ in Germany, was not recognised as being different from a human skull in the early days. 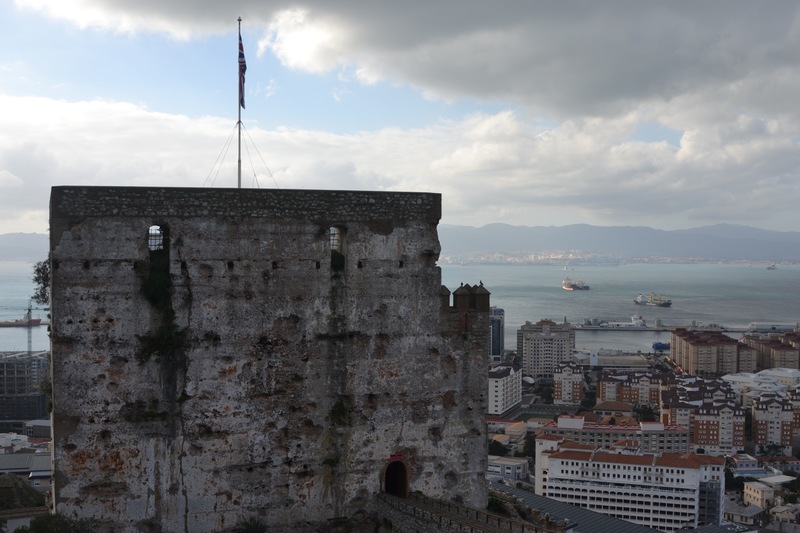 It was thanks to the work of amateur scientists and archaeologists in the British military that early excavation work was carried out in Gibraltar. 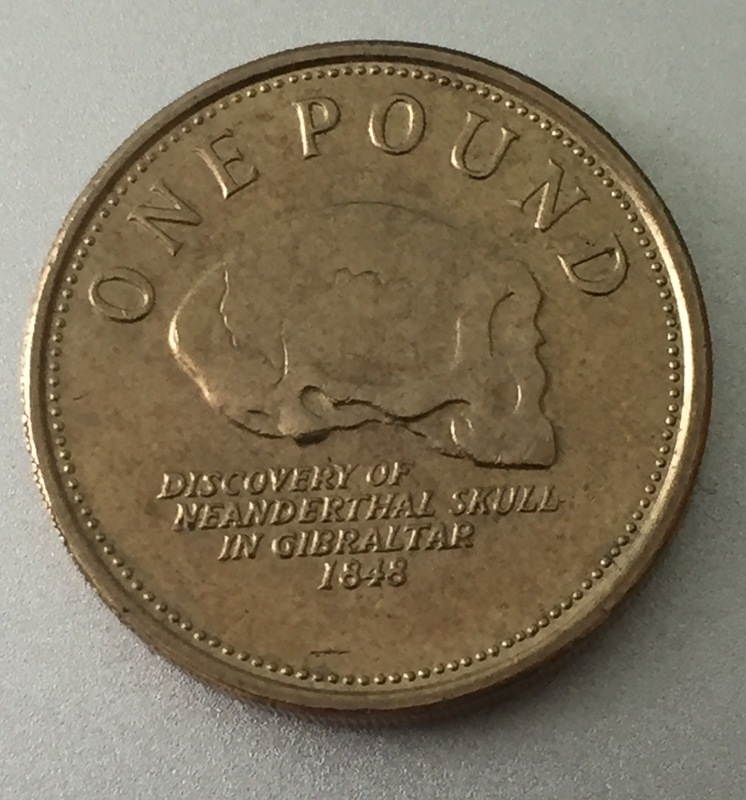 It was a chance meeting of one of these achaeologists and a visiting physician (who was aware of the Neanderthal discovery) which lead to the skull being identified as being from a different species. When it was taken to London for further investigations it was seen by a whole host of prominent figures including Charles Darwin, who described it as “the wonderful Gibraltar skull”. Dr Menez said that he believes this skull was of much more importance than the one found in the Neander Valley, because this one has a face. He went on to say that it’s still a valuable fossil and catalyst as it still captivates people all these years later. The Gibraltar skull can be seen at the Natural History Museum in London, a replica is on display at the Gibraltar National Museum. In a talk entitled “The poem I’ll never write” Giordano took us back to his childhood living in Upper Town and extolled the benefits of living alongside and going to school with families from all walks of life. He said he was educated with children who’s parents were accountants and doctors, and others who’s parents were tobacco smugglers. He said that unlike in the UK, where there’s an early segregation of children from different backgrounds, his upbringing in Upper Town granted him “entry into two worlds in a frictionless way”. After leaving Gibraltar to study Philosphy in London, he returned to the Rock and found work as a prison officer for 3 years. Again, he said that he was able to mix with people from all echelons of society, something which has now been reflected in his poetry which focuses on “the harsh beauty” of characters living on the fringes of society. Now working as a journalist, Giordano pinpointed the moment he first felt compelled to write a poem; after catching the waft of bleach as he walked past Bishop Canilla House one day back in September 2016. The smell triggered something which led him to write the poem; Bishop Canilla House, which is the first in his collection of poems ‘West‘. His collection is split into four sections focusing on Gibraltar, Spain, the UK and a miscellaneous section to end with – it draws from his own personal experiences and observations. Describing himself as a philosophical poet, he says he fights against clichés both in his journalism and writing saying “clichés are the enemy of original thinking and limit one’s view of the world”. As for the poem he’ll never write? 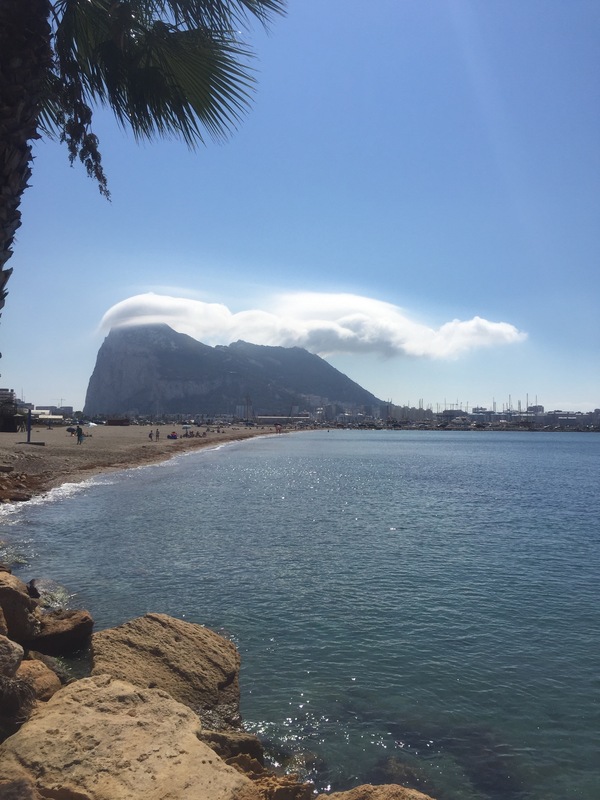 Well, it would be about Gibraltarian identity, “an epic Llanito poem” charting the rise from notoriety of a young Gibraltarian hoodlum or ‘vrada’ from his life of petty crime to a new found respectability as a lawyer who marries Miss Gibraltar. Giordano claims the process of writing the poem, committing the Llanito dialect to paper, would fall short of what he wants to convey. I for one, would love to read it if he ever finds the right words…. On Friday, I was transported to the Medieval world of Game of Thrones during a fascinating talk by Oxford University Fellow and Tutor of Medieval English Literature, Carolyne Larrington. Her book came about after a meeting with her publisher about another project. They found the conversation kept returning to her fascination with Game of Thrones, and her publisher suggested she should write a book about that as well. In fact, she described her binge reading of the George R.R. Martin stories as the “lost summer of 2012”. Drawing parallels between the world of the Seven Kingdoms and actual historical fact, Carolyne explained where she believes Martin got the inspiration for the settings and events in his epic tale. The Hereford Cathedral Mappamundi (map of the world) is a possible inspiration for his map of the Seven Kingdoms, with the Mediterranean Sea a basis on which to model the Narrow Sea. Westeros, she believes has a very British feel with “European bits” (I always imagined Hadrian’s Wall when reading about the Wall) and that the Dothraki are very similar to the real life Mongols. The social settings for the story are also, she says rooted in reality, with the northern way of doing things at Winterfell very similar to an Anglo Saxon English earldom and Kings Landing being more like a medieval court and city. It was fascinating to hear how many parallels there are between historical fact and this huge work of fiction. This was a hugely entertaining talk for anyone who has read Martin’s books or seen the HBO TV series. And finally, my last Gibraltar Literary Festival experience this year was with TV actor, playwright and ‘cosy crime’ writer, Robert Daws. 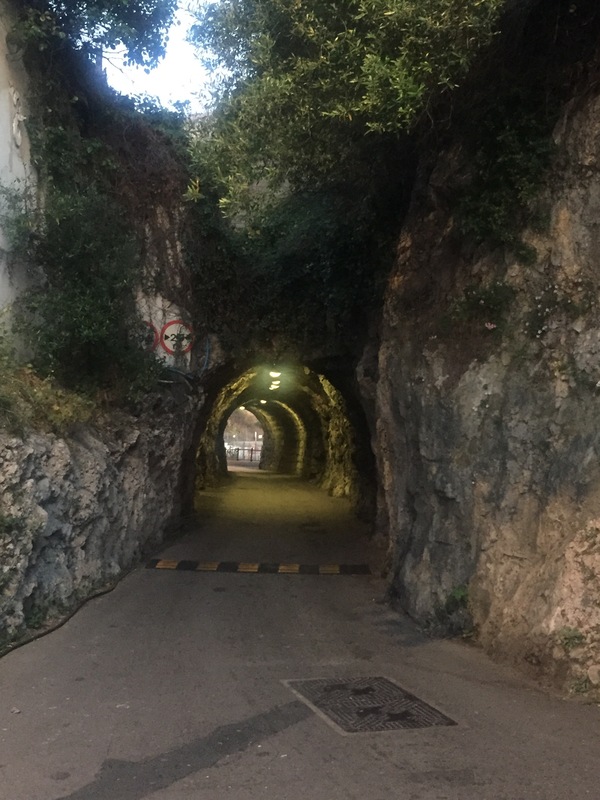 To date he has written four stories featuring police officers Detective Sergeant Tamara Sullivan and Chief Inspector Gus Broderick of the Royal Gibraltar Police. His first novella, The Rock was published back in 2012, and was followed by a full-length sequel; The Poisoned Rock in 2017. His third novel Killing Rock is due out early next year. 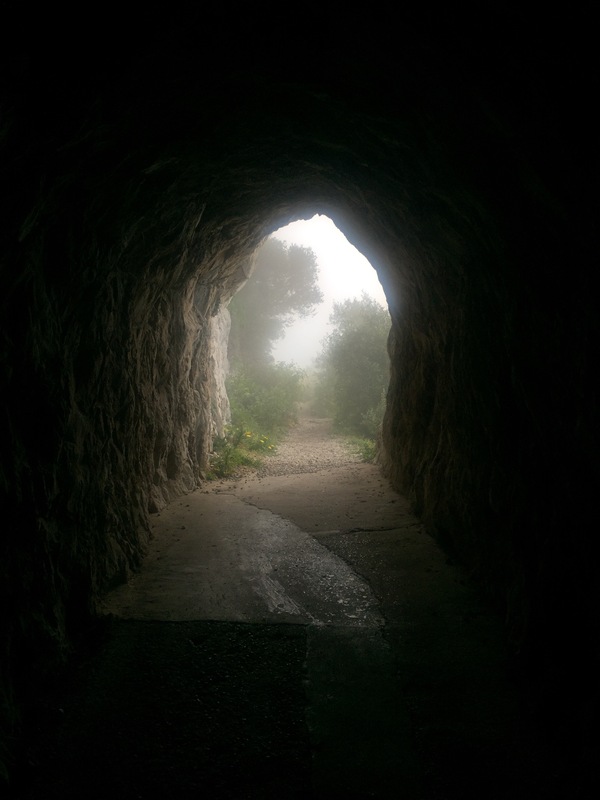 At his talk on Friday afternoon, he first of all treated his audience to a reading of a short story featuring DS Sullivan; Tunnel Vision, a ghostly tale set in the Dudley Ward tunnel – it was captivating. Robert went on to explain how he got into writing novels, after a screenplay he had written didn’t get made and he thought his plot would easily transfer location to Gibraltar. That screenplay evolved into his first novella, The Rock. 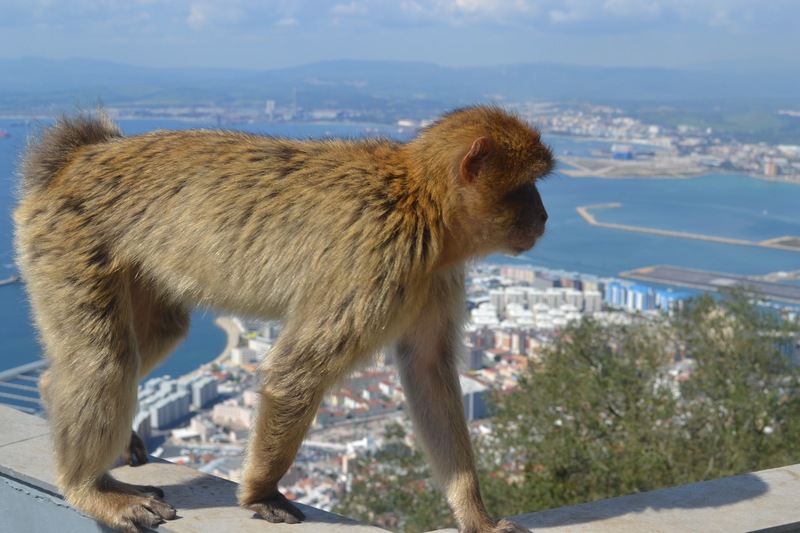 It was a family connection which first brought him to Gibraltar around 30 years ago, and he has been visiting every year since. It was his knowledge of the place, it’s streets and people which gave him the background to set his books here. Robert has been to the Gibraltar Literary Festival on several occasions before and this wasn’t his only talk, he gave another one on Saturday and also appeared in Just a Minute on Sunday. Robert also spoke a little about his work as a screen and stage actor (on Poldark, The Royal and Outside Edge), recounting anecdotes about productions and colleagues with affable charm and wit. As the talk drew to a close, we were again treated to a reading, this time of an excerpt of his third, and soon to be published Sullivan and Broderick mystery; Killing Rock. I shall be looking out for that one when it hits the shops. I was lucky enough to meet Robert before his talk (he has followed Postcard from Gibraltar for a while now – fancy that!) and he is a truly lovely man. (If you’re reading this Robert, thank you again for being so generous with your time). 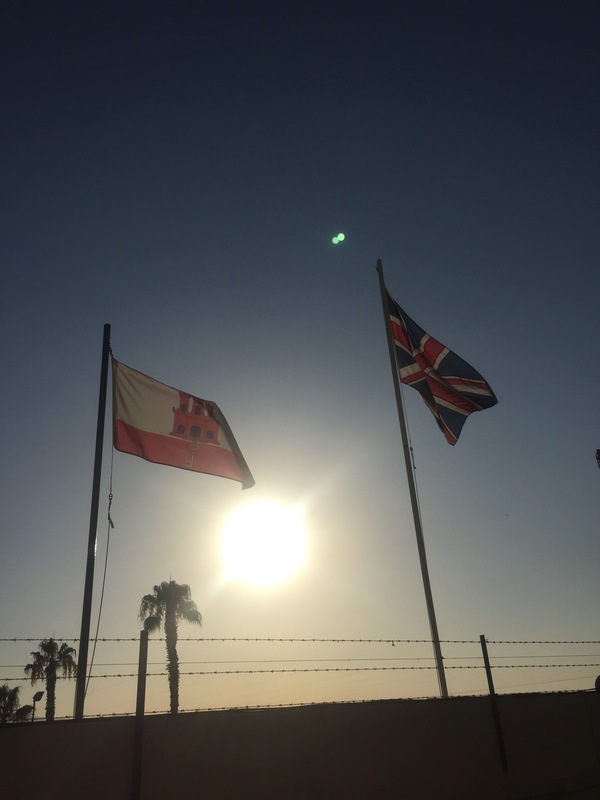 So that is my experience of the Gibraltar Literary Festival 2018. It’s a brilliant event, with so many diverse speakers and topics to see – I just wish I’d had more time to see even more. I’m counting down the days until next year…. This week didn’t quite start out as planned, I had a poorly Little Postcard off school with a nasty bug. Thankfully, so far my ninja-like skills at disinfecting every surface in the house has meant no one else has succumbed….yet. As a consequence, much of the start of the week was spent at home on nurse duty. 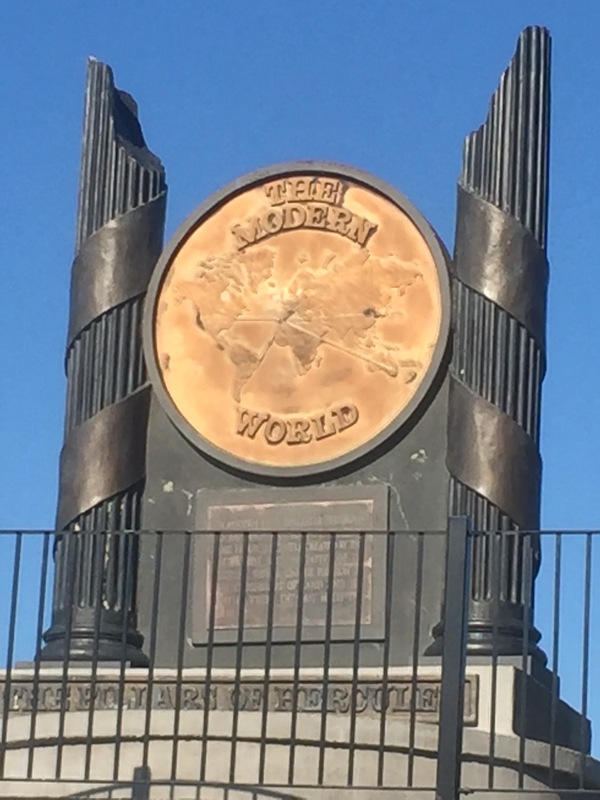 Last Sunday, of course was Armistice Day and Gibraltar paid tribute with what’s believed to be the world’s biggest ‘Tommy’ projection on to the North face of the Rock. 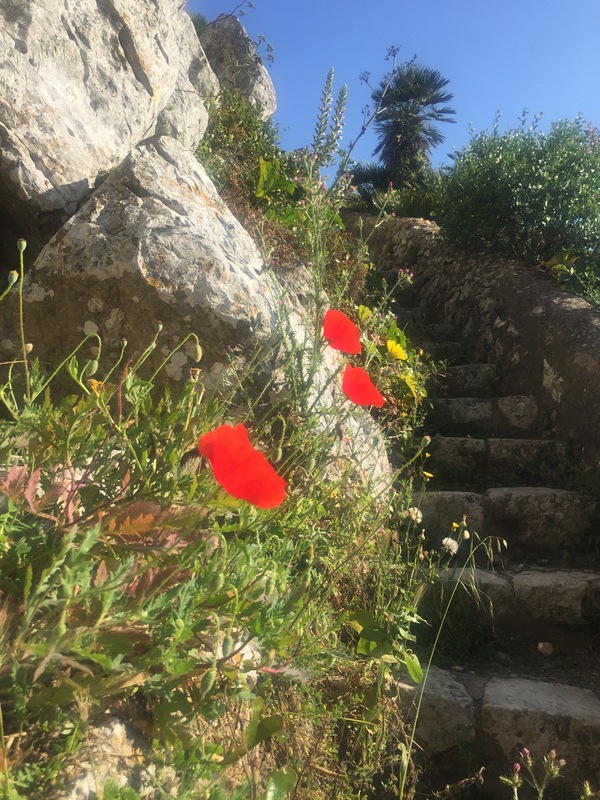 The image of poppies was also projected into Moorish Castle after dark. I managed to escape the house of sickness briefly on Monday and ended up parking out by the small boat marina. The water was so still and reflected the Rock beautifully. 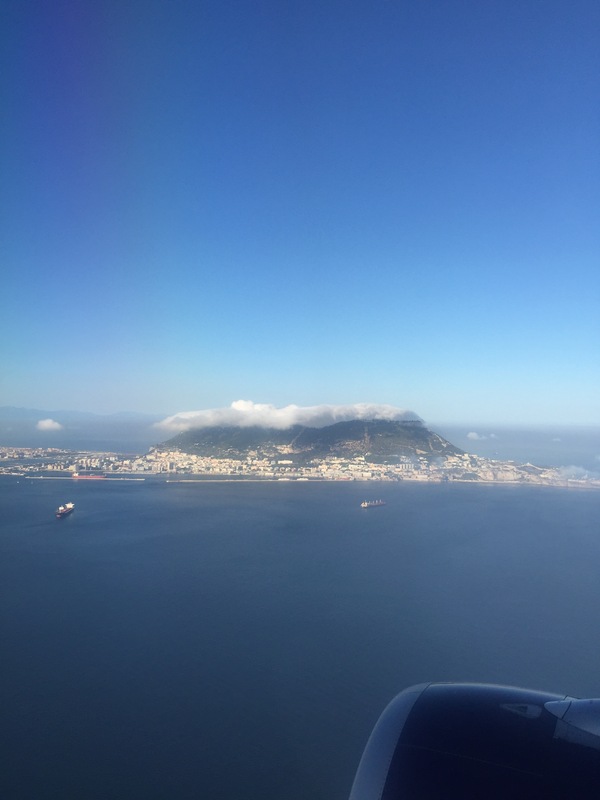 By Thursday things returned to normal and just in time for a fab event in Gibraltar, the Gibraltar Literary Festival. It’s in its sixth year, and I went along to a few of the events. 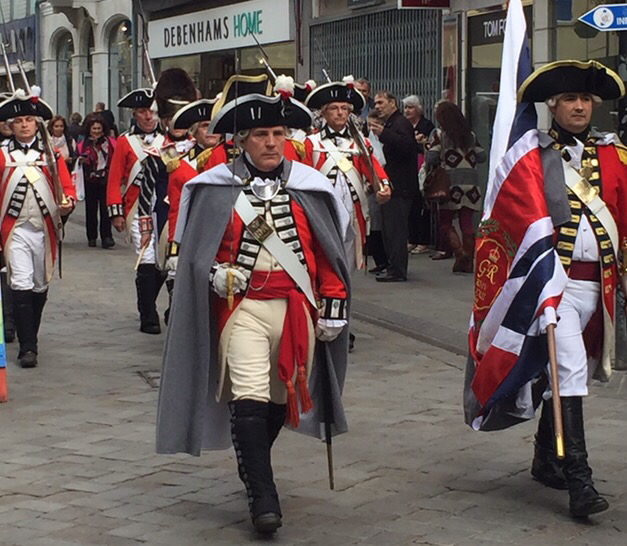 It’s by far my favourite annual Gibraltar event, there’s such a buzz in town and I just love it! On Friday I got to do something quite exciting and out of the ordinary for me. I met one of the visiting writers who has been here for the Literary Festival for a project I’m working on. He has been following Postcard from Gibraltar for a while now and it was super to meet him in real life. I’m very grateful for him taking time out of his hectic schedule to have coffee and a chat with me on the Sunborn. One of the things I love about living here is the people you meet and the opportunities which can arise. All ready for the match! Gibraltar was hosting Armenia in the UEFA Nations League on Friday, Moorish Castle was wearing its kit in anticipation. Unfortunately the result didn’t go Gibraltar’s way after the last two wins, but you can’t win them all. 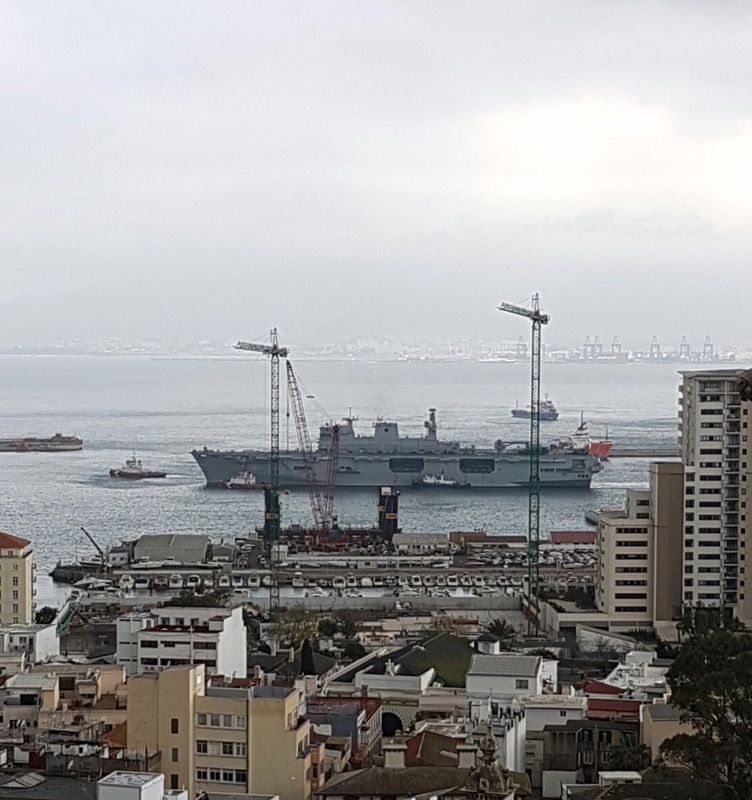 We have a couple of Royal Navy ships in port at present. This, I think, was HMS Diamond as she came into port at the end of the week. It’s been a bit damp of late here in Gibraltar. So far, I’ve been lucky enough to miss the worst of it, but I did get a bit of a soaking yesterday. 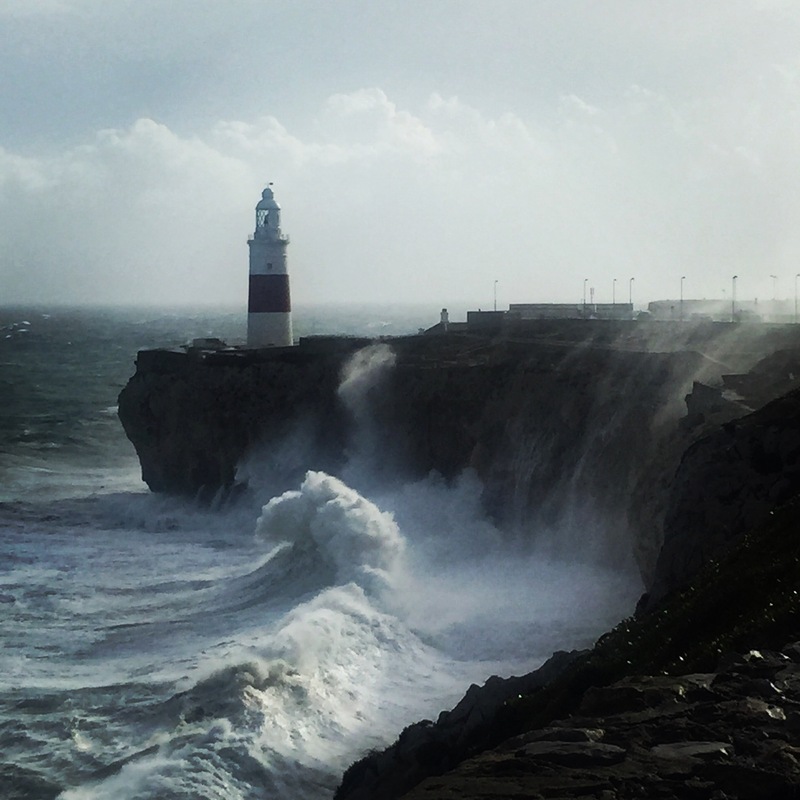 The bad weather has continued today…. That’s it for Sunday Sevens this week, thanks for stopping by! As always, I’m linking with Natalie from Threads and Bobbins for this weekly blog series. Last summer, we visited Southern France and stopped off for a few days in the beautiful medieval city of Carcassonne. It’s taken me a while, but at last, I have finally got round to writing this long awaited postcard…. Fate brought me and Carcassonne together. Several years ago, while visiting family in the UK we found ourselves with babysitters for a couple of hours one evening so we visited a nearby pub. The establishment in question had shelves of second hand books for drinkers to read and Mr Postcard perused the books as we waited for our drinks. He handed me a rather dog-eared green book with a golden circular labyrinth image on the front and said “I think that’s up your street”. He was right. I read the blurb on the back and was immediately drawn in (we were at the pub with Mr Postcard’s brother and I was very antisocial I’m afraid, because I became absorbed by the book which had found its way into my hands). I felt a bit disappointed when the time came to leave and go home, reluctantly I replaced the book on the shelf and made a mental note to hunt down my own copy. Fortuitously, as we walked through the airport to catch our flight back to Gibraltar, I spotted a brand spanking new copy of the book in a shop and had just enough time to buy it before catching our plane. The book was Labyrinth by Kate Mosse. I loved it, both the characters and the setting of Carcassonne. It sounded like such a magical, special place. For the first time ever, I felt compelled to visit a place I had read about. I had no idea when that would happen, just that I really wanted to go there. I went on to read the next two books in the Languedoc trilogy (Sepulchre & Citadel) and thoroughly enjoyed them both. I even got the members of the book club I belong to to read Labyrinth (I had to spread the love). Then, in 2015, I had the good fortune to be able to see a talk with the author, Kate Mosse, when she came to the Gibraltar Literary Festival. I went to hear her talk about her latest book, the Taxidermist’s Daughter, but unfortunately I couldn’t stay on afterwards to meet her (as I had to dash off to collect a child). I rushed back later with said child in tow in the hope that I would be able to get my book signed. I couldn’t believe my luck. As we arrived at the front door of the hall where Kate had been speaking, there she was, about to leave, alongside another literary heroine of mine, Joanne Harris. Totally star struck, and full of apologies for detaining her further I asked if she would mind signing my book. She was very gracious and obliged. And so, several years had passed since I first laid eyes on Labyrinth and last summer we were planning a trip to France. 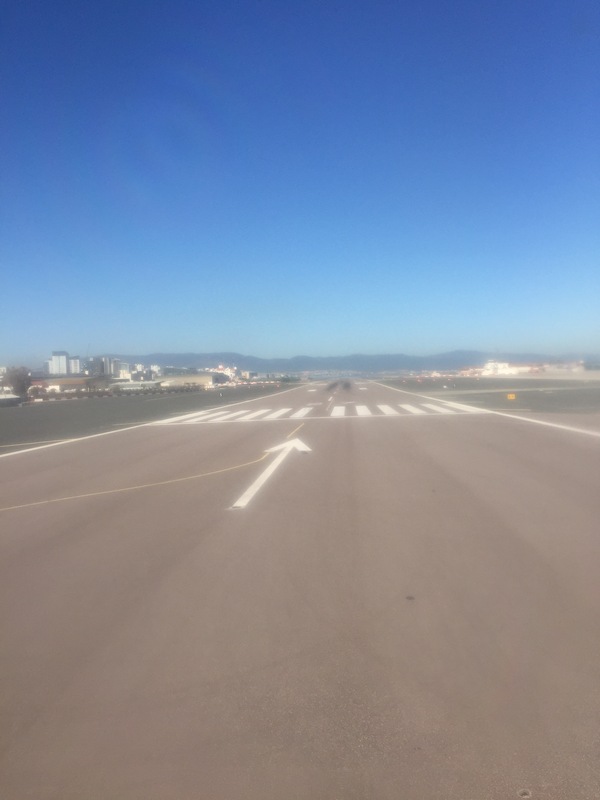 There were two direct flights available from Malaga airport, to Paris and Toulouse. We opted for Toulouse as we fancied exploring somewhere we hadn’t visited before. It was only after booking the flight that the penny dropped that Carcassonne wasn’t far from Toulouse. [I may have applied a little pressure for us to hire a car so we could have a day trip out to Carcassonne ;-)]. As it turned out, Mr Postcard surprised me by booking a gîte just outside the old city walls for a few nights so that we could explore Carcassonne properly. I can’t tell you how happy that made me! I’m not sure I have enough superlatives to describe the medieval Cité. It’s just beautiful and as atmospheric as I imagined. We had a day or so to potter around the narrow streets by ourselves, before going on a pre-booked tour with a guide, so that we didn’t miss anything. It’s taken me a while, but at last, I have finally got round to writing this long awaited postcard…. The first thing I was struck by, was how well preserved the medieval Cité was. Sitting atop a hill with a clear view of the River Aude, it looked magestic. It hasn’t always been so though. After its heyday, the Cité fell into disrepair and locals moved out into the modern city on the opposite side of the river. Over time the stones of the Cité walls and its buildings began to be taken by scavengers who needed the stone for new buildings in the new city, effectively turning it into a quarry. It wasn’t until 1853 that Eugène Viollet-le-Duc was given the job of attempting to restore the Cité to its former glory. It is his Carcassonne which you see today when you visit. 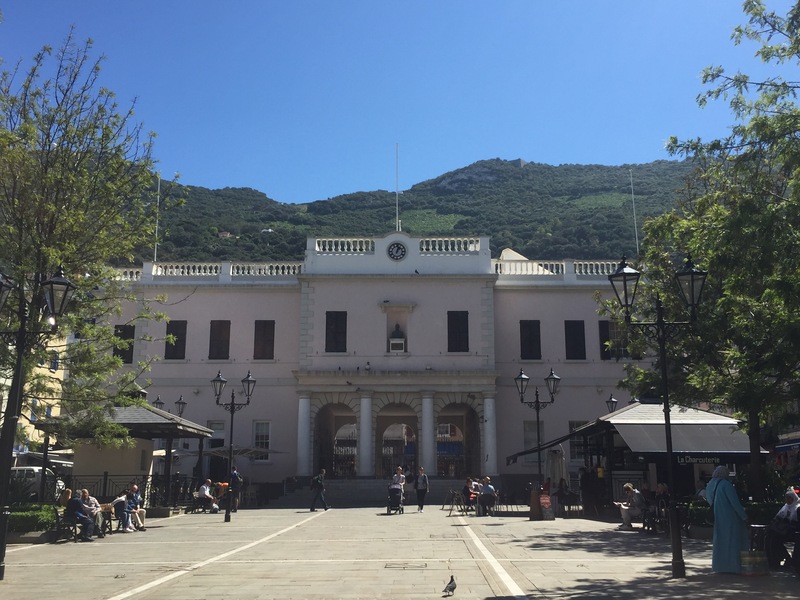 Although we did have plenty of time to explore the ancient streets and buildings ourselves, we decided to pay to join one of the official guided tours which left from the tourist office on a regular basis. We gathered together under the giant horse chestnut trees outside the main entrance of the Cité to begin our tour. One of the first questions our guide asked was whether any of us English speakers had read Labyrinth. I was the only one and put my hand up. I just happened to have my copy with me (it was at this point that the Little Postcards died in embarrassment and ever so slightly disowned me! Cue the cry of “Muuuum! I can’t believe you brought that with you!”). We were led in over the drawbridge (which isn’t original, it was created during the renovation works). 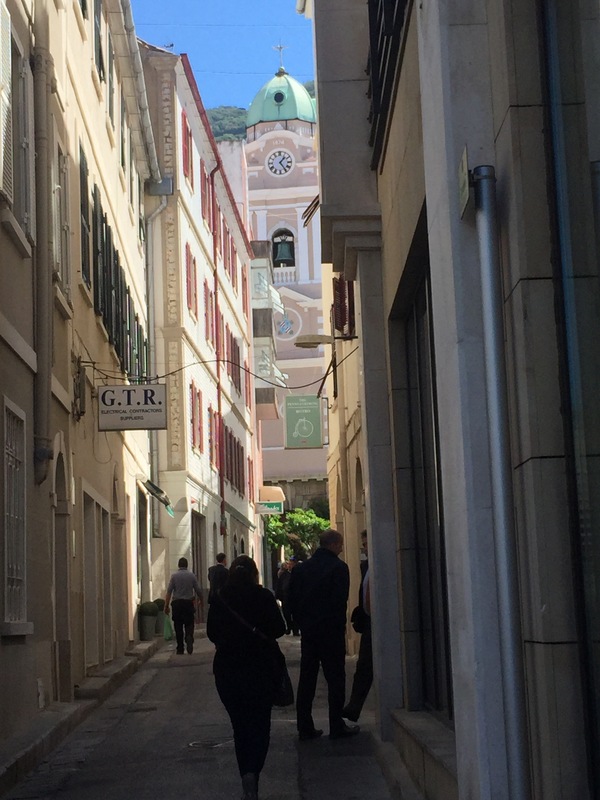 Our first port of call was the Lices area between the two sets of ancient walls which encircle the Cité. Once filled with housing for the less well off in society, but now cleared to make a pleasant green area. We then headed into the rabbit warren of streets and alleyways. Full of hidden corners and nookie holes and history. The architecture is really beautiful. I’m so glad that we did take the tour, the significance of certain buildings were highlighted and it put the Cité into a much clearer context both in medieval times and the intervening years. The most interesting thing I learned was that it became the Southern French HQ of the Gestapo during WWII and they took over the 5* Hotel de la Cité as they explored the surrounding mountains of Languedoc in search of buried Cathar treasure. In more recent times a host of celebrities from Michael Jackson to the Queen Mother have stayed there. The Basilica of Saint-Nazaire nearby is surrounded with some very ominous looking gargoyles. They must have seen some sights over the centuries! Inside the Cathedral are the most stunning stained glass windows. We bought tickets to go into the 12th Century Château Comtal, which is the only part of the Cité you have to pay to enter. Another interesting fact is that the Château Comtal (which is where Alaïs, the heroine of Labyrinth lives at the start of the novel), was actually used as a location in the making of the Kevin Costner film; Robin Hood Prince of Theives. The exterior of the Château became the outside of Nottingham Castle, home to Alan Rickman’s Sheriff of Nottingham. While much of the Château is just a network of empty rooms which tourists wander through on a trail from one section to another, the views were pretty spectacular from the windows. (There may have been some really interesting stuff in there but I had a slightly impatient 5 year old with me, who’s patience had run out, so it was a bit of a whistle stop tour for us). Inside the Château is a collection of archaeological exhibits from the Cité’s past. The end of the Château tour led us out onto the inner ramparts, which afforded us lovely views across the valley and to the more modern city beyond the River Aude. Every day we were in Carcassonne, it was busy with tourists. However, as we were staying nearby, we were lucky enough to be able to come back up to the Cité in the evenings and enjoy it while the streets were a good bit quieter, and really soak up the atmosphere among the medieval buildings. I had high hopes for Carcassonne before I had arrived, and it didn’t disappoint. The atmosphere and the architecture are just lovely. As an old romantic who would love to live in a castle, it was marvellous to spend some time there. So that was last summer, and as luck would have it just two weeks ago this beauty was published…. …. another Kate Mosse novel which is partially set in Carcassonne. This time I can read it knowing exactly what the places are like which are described in it’s pages. I had to patiently wait for my copy to make it down to Gibraltar, but now it’s here, and I’m off to put the kettle on and start reading! Thanks for stopping by, and if you made it all the way to the end of this particularly long postcard – thank you! You deserve a pat on the back!! Crumbs, it’s looking awfully like we are on the cusp of another New Year, it surely can’t be a whole year since the last one, it’s gone far too fast. 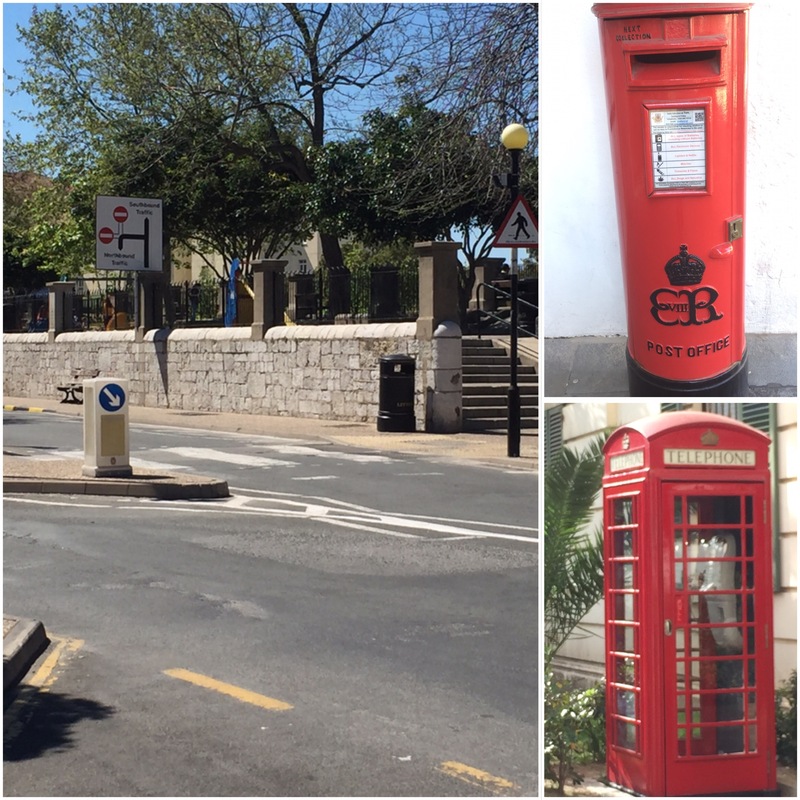 I guess now’s as good a time as any to have a look back at some of my Postcard from Gibraltar highlights from the past 12 months…. A new year meant a new challenge for me this year, a photo challenge. 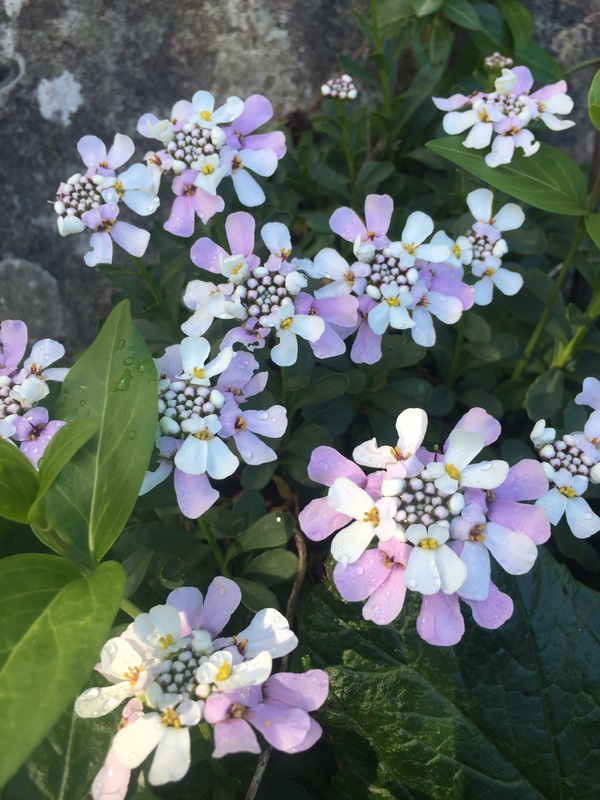 Last year I read Nana Cathy’s blog and was intrigued by her weekly photo challenge. When January came around I thought I’d join in myself. It’s been such fun and quite inspiring throughout the year to have weekly prompts to find pictures for. If you fancy joining in check out Wild Daffodil’s blog for more information. Also in January I joined forces with my friend Kate of H and FlossieDoodle to start the Gibraltar Crochet Collective. We did meet weekly to crochet and chat over coffee although our meetings have got less and less frequent due to other commitments lately. Our mascots Gib and Rocksy went for a bit of an adventure. Another new project for me this month was my podcast, you can find my blogposts and the related podcasts here. 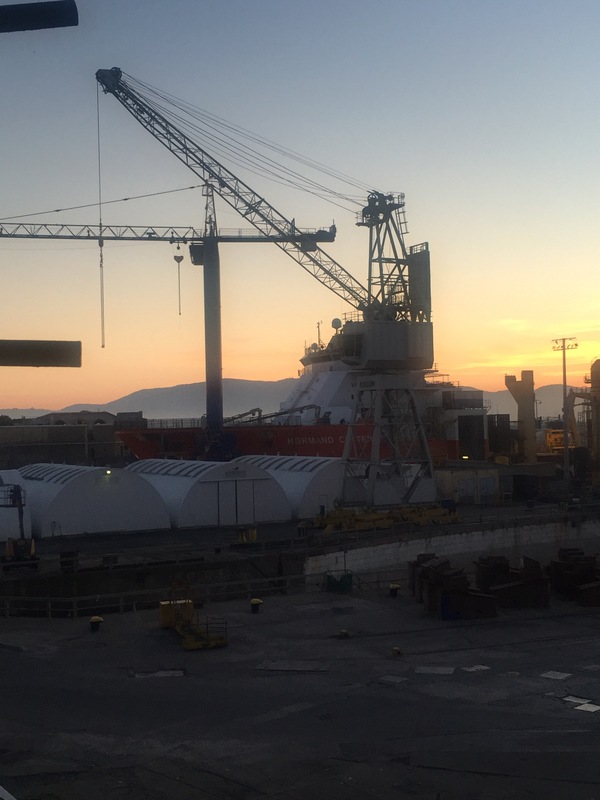 In February I ran my Creative Gibraltar series looking at some of the very talented craftspeople who live in Gibraltar. I began with my lovely watercolour teacher Deborah M Lawson and ended with local craftswoman and up-cycling guru Sue Orfila. February also brought us the 2017 installment of Gib Talks. I was also fortunate to be able to speak to Gib Talks organiser Julian Felice before the event for one of my podcasts. March was a month for Lenten crochet (far easier than giving up chocolate) which helped support the Sixty Million Trebles effort, a beautiful Suffolk family wedding and a sad goodbye to our rescue bunny Snowflake. April began for us in Southwold in Suffolk, one of our favourite places and involved a lot of Med Steps training, which was very handy for burning off those seaside fish and chips! I was also able to finish another Sixty Million Trebles blanket – this one from the Gibraltar Crochet Collective. May meant Med Steps 5 Challenge again this year and I even managed to beat my time from last year! You can hear my podcast about it here. We also flew back to the UK for our second family wedding of the year. June started for us in Wigan in Lancashire, the location of our latest wedding and the perfect setting for a lovely walk. It was also the Calentita! food festival in Gibraltar. 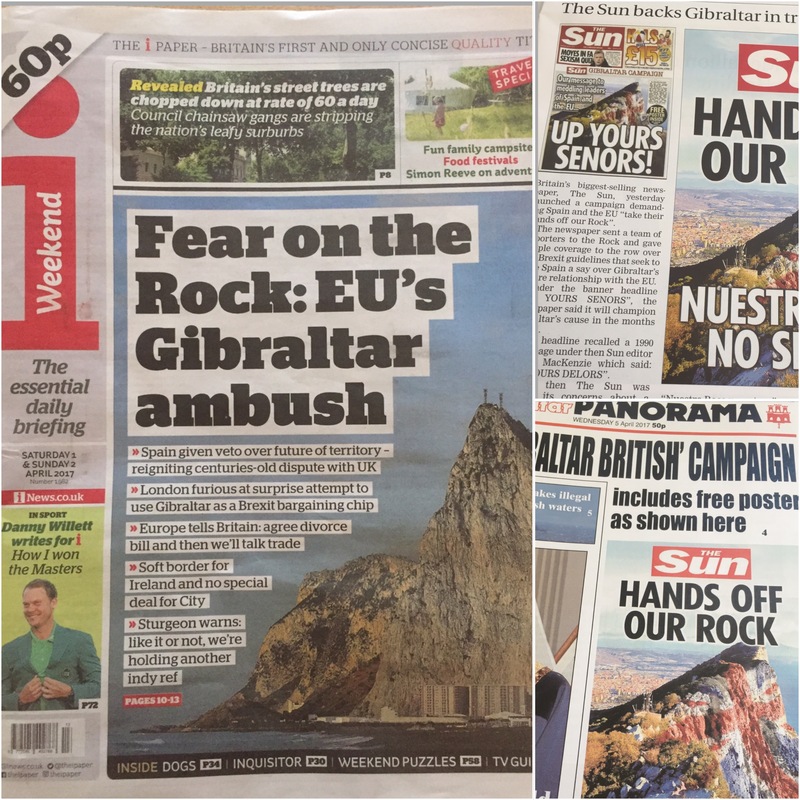 (For some reason the same aerial photo of Gibraltar appeared in May and June’s collages – not sure why that was. It is a good photo though don’t you think?). In July our big summer of travel began with a trip up to the North West of England and a flying visit to North Wales. We also drove to Portugal. This has got to be my most cosmopolitan of all months, featuring travel in Portugal, Rome, France and of course good old Gibraltar. Which reminds me, I have loads of holiday photos on my phone and camera SD card which are crying out to become blog posts – watch this space in the New Year. 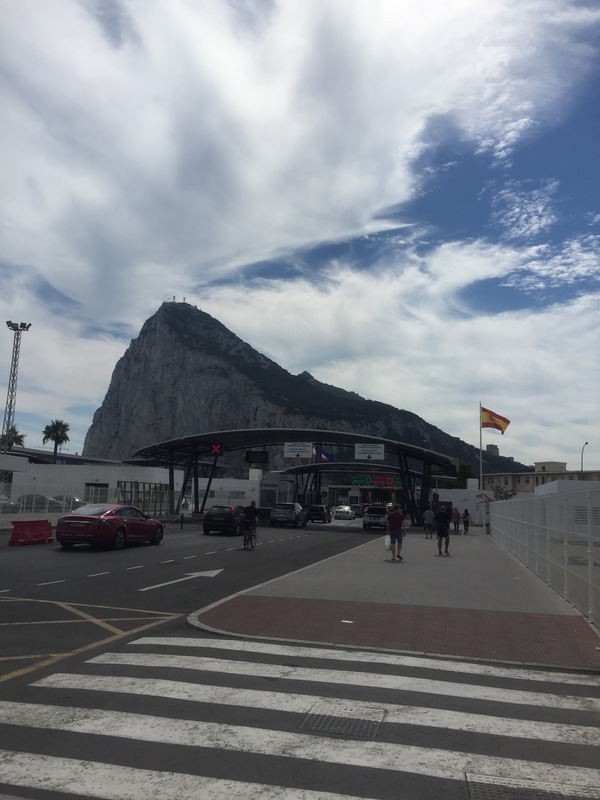 September is a big month on the Rock, this year more than most as Gibraltarians celebrated the 50th anniversary of the 1967 Referendum when they voted overwhelmingly to remain British. Gibraltar National Day on 10th September coincidentally happened to be the day of my 100th Sunday Sevens. We also had a fabulous music festival. October brought with it some interesting weather, beautiful sunshine, murky mists and exciting lightning storms. November was a good crochet month for me as I finally got around to making last year’s Little Box of Crochet autumn wreath. 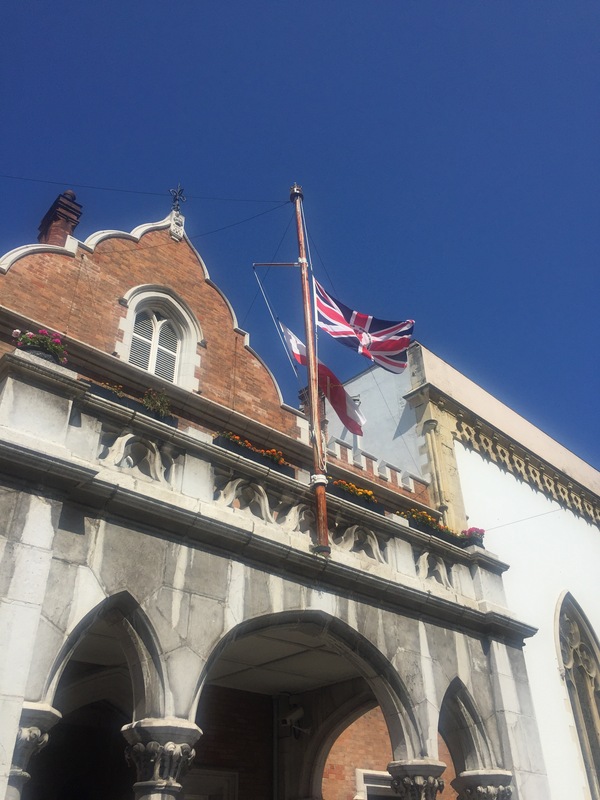 I also greatly enjoyed this year’s Gibraltar Literary Festival with talks by Nicholas Parsons, Patrick Gale and local photographers and naturalists Clive, Geraldine and Stewart Finlayson. December seems to have rushed by in a flurry of end of term carol concerts and panicked making of Christmas presents (some of which failed to get finished in time). There have been some opportunities for peace and quiet though, namely the last Saturday before Christmas when we avoided the shops and headed for the beach for peace and tranquility. 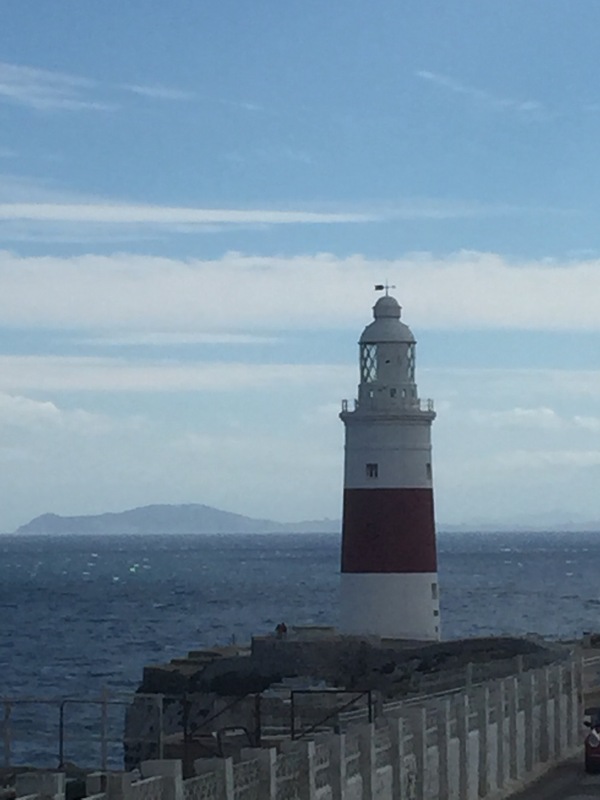 For the second year running, during the long summer holiday we get in Gibraltar, I decided to set aside a little time each day to do something crafty and I documented this with my Summer Craft Challenge. Each day I featured a photo on Instagram and each week I wrote a blog post on my progress. This year, I returned to work part-time after 13 years as a full-time, stay at home Mum. 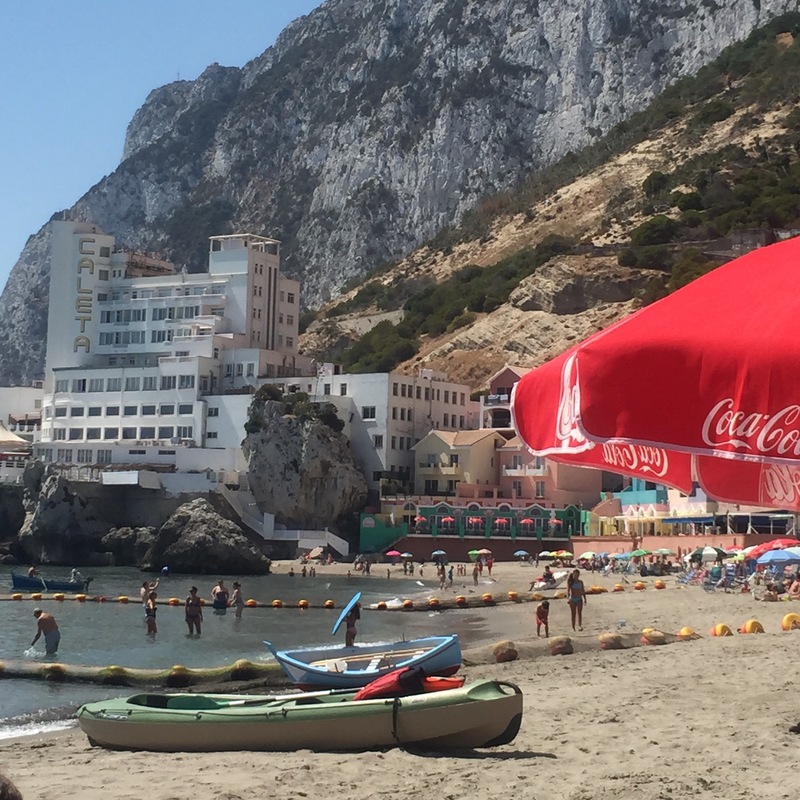 I have to admit that during the last few months I have found it hard to make time for Postcard from Gibraltar alongside my new commitments and at times I’ve wondered whether I can actually keep it up. I have had some really lovely comments and support from my online friends and that’s kept me going. Thank goodness I have Sunday Sevens and the weekly photo challenge to keep me ticking over during ‘dry’ spells. I think I would really miss the community I have ‘met’ through Postcard from Gibraltar, and if I’m honest, it’s you and the support you’ve given me which gave me the confidence to apply for the job in the first place. Thank you very much to everyone who’s taken the time to read my posts over the past 2 and a half years, and for the virtual friendship you have given me too – it’s not taken for granted. Every comment and like is very much appreciated. Here’s to 2018 and all the wonderful challenges it may bring! This time last week, ticket in hand, I lined up to have my bag searched before taking my seat in the Convent Ballroom. It was that magical time of the year again when (to me at least) the town centre is buzzing with excitement. Posh cars draw up to venues to deliver public figures to their talks and there’s the chance of bumping into Maureen Lipman or Kate Adie outside M&S. 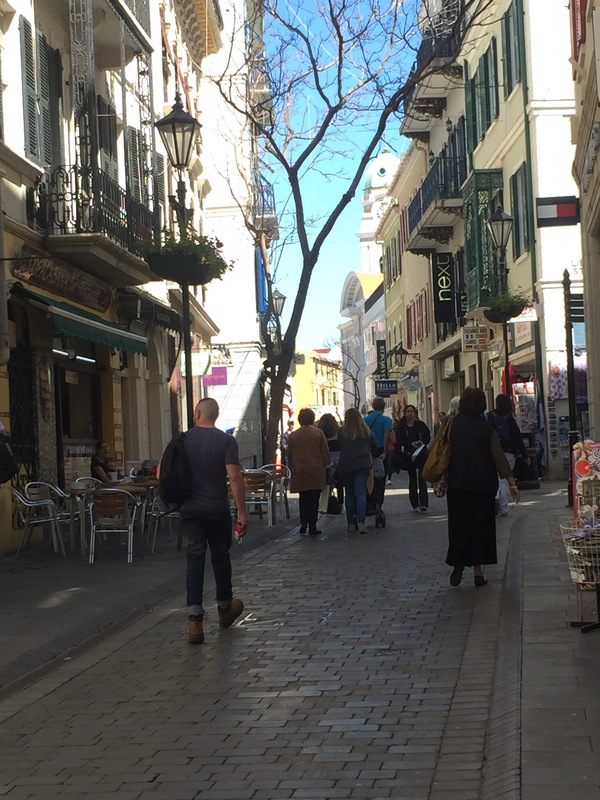 I am of course talking about the annual Gibraltar Literary Festival. 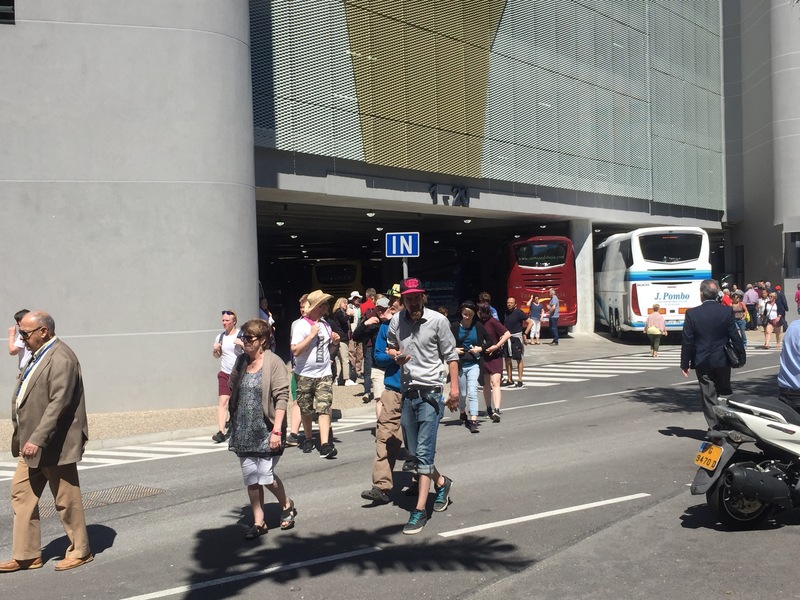 Now in it’s fifth edition, the organisers have said they sold over 3,000 tickets for the events. The whole festival ran over four days with daytime and evening functions. The fact that, as a mum with young children, I can get to some talks during school hours is just wonderful for me. This year I was only able to attend a handful of talks due to other commitments, but it was still a great highlight to my month. 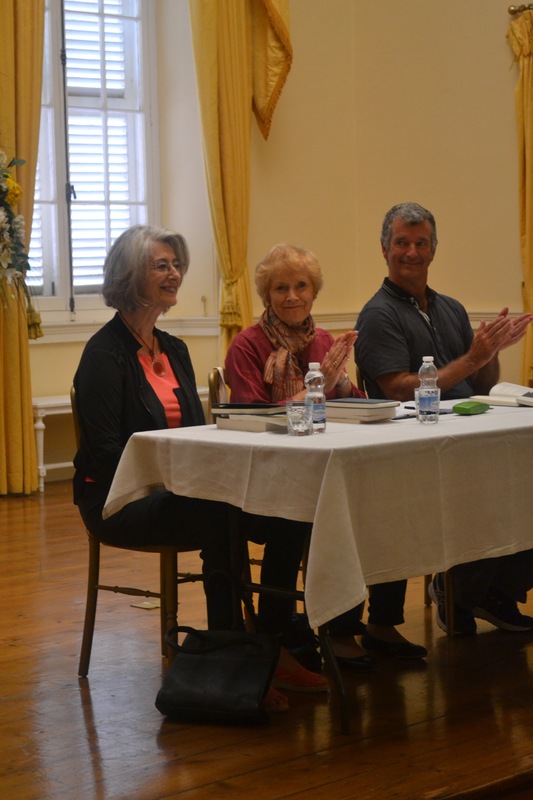 My first event was a fascinating talk by three members of the same family in the grand surroundings of the Convent. Clive, Geraldine and Stewart Finlayson have produced a coffee table book filled with stunning wildlife photos. Their book ‘Lost World : Secrets of a World Heritage Site’ was born out of the research work they have done in the Gotham’s Cave complex. The network of caves and area of the Upper Rock Nature Reserve was the site of the first ever discovery of a Neanderthal Skull. In order to better understand the environment that the Gibraltar Neanderthals inhabited, the Finlaysons traveled around the globe to photograph and study creatures as diverse as from leopards to snowy owls, gannets to wolves. 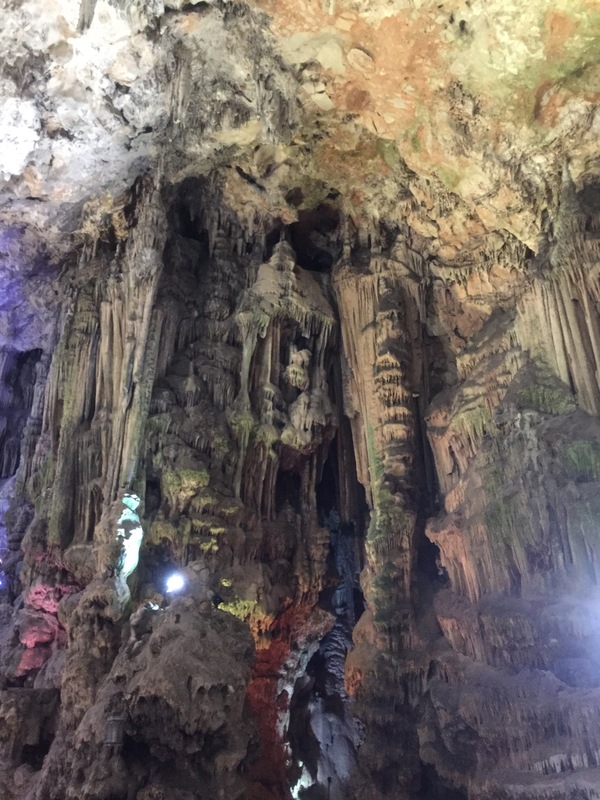 Many of the fossilised animal remains found in Gotham’s Cave are now no longer resident in the area due to climatic changes but they can be found elsewhere. The lengths that the authors went to, to actually capture these beautiful creatures in their natural habitats is quite something. The stories they told of being on the lookout for lions in the Savannah while their guide changed not one, but four wheels on their safari truck or lying in snow in sub-zero temperatures for hours to capture a picture of a snowy owl were inspiring. The Garrison Library was the venue for my next talk, a conversation with Patrick Gale (above right). The novelist spoke about his childhood, growing up in Wandsworth Prison, where his father was Governor and early career as a piano playing singing waiter in Convent Garden (he had taken the cabaret job in an attempt to gain an Equity card so he could become an actor). It was during down times during his overnight waiting shifts that he began to write and subsequently published his first two novels on the same day. Since his early night shift writing, he has written prolifically with novels, short stories and TV screenplays to his name. Perhaps the most famous of these is ‘Man in the Orange Shirt’, which featured in the Gay Britannia season on BBC 2. Patrick’s conversation with Chief Fiction Reviewer at the Sunday Times, Peter Kemp, was funny and at times very touching as he discussed his own sexuality and that of his great grandfather, whom his latest novel ‘A place called Winter’ is based on. Patrick came across as a very generous writer, and was keen to encourage anyone thinking of having a go at writing a novel to be brave and do it. 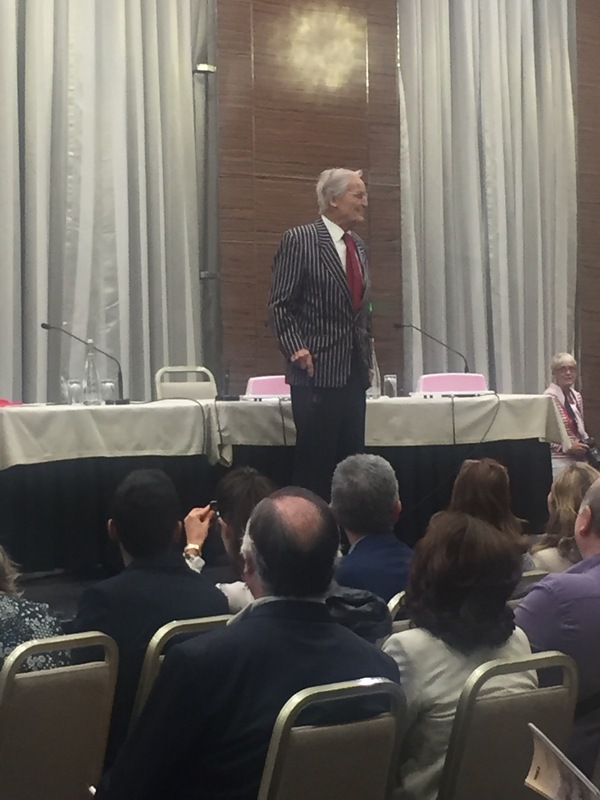 The John Mackintosh Hall was the location of my last Gibraltar Literary Festival event, Just Laugh a Minute, with veteran broadcaster Nicholas Parsons. Despite being in his nineties, the entertainer showed no sign of slowing down and was keen to prove that despite his legs not working as well as they used to, his brain is still in good working order. He spoke for an hour (without any notes) reminiscing about his childhood and his first forays into entertainment by impersonating his prep school master which earned him a caning. His account of his apprenticeship in the Clyde dockyards brought many laughs as he described the communal toilet arrangements. He then went on to recount his first job on wartime BBC radio, broadcasting from a disused cinema in north Wales and his brief career in the Merchant Navy which was cut short (just 5 days in) due to ill health. Now a Gibraltar Literary Festival regular, Nicolas Parsons was great fun to listen to, and sounded like he could keep going for hours, had he been allowed. He put his good memory down to the fact he is dyslexic, saying he instinctively uses his memory to get by. I would’ve loved to have gone to see Kate Adie speak, as one of my heroines growing up, I think her talk would have been fascinating. Sadly I left it too late to book my tickets and the event had already sold out. I have a couple of her books though to read, so I shall content myself with that. 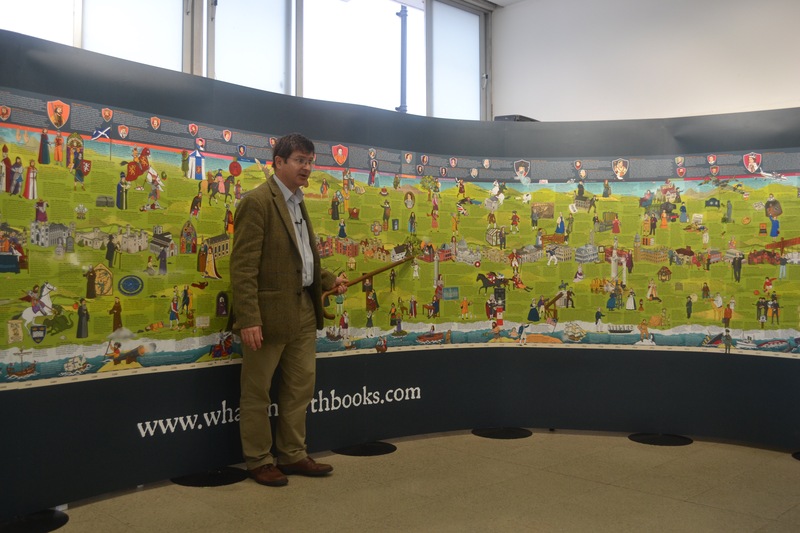 The What on Earth Wall Book ‘The Story of Gibraltar’ which charts the history of the Rock from prehistory to present day sold in excess of 900 copies. 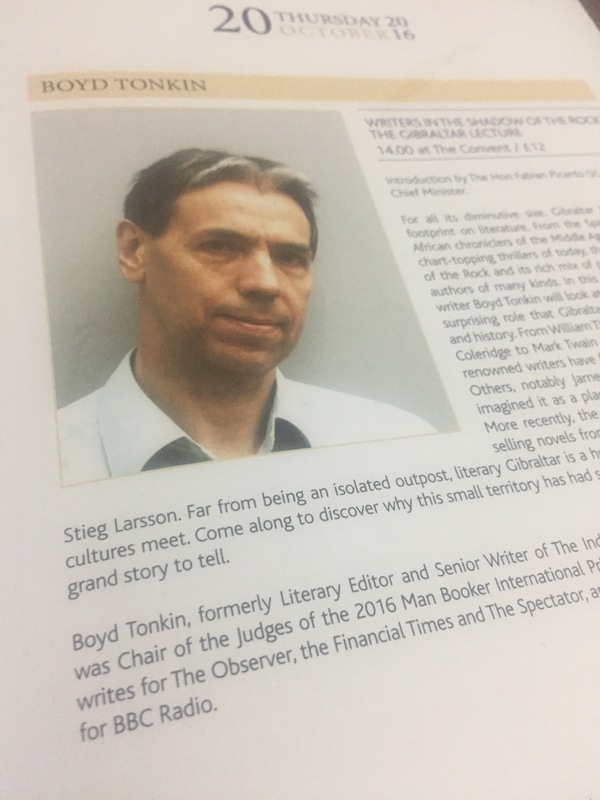 That makes it’s author, Christopher Lloyd, the most successful author in the Festival’s history. 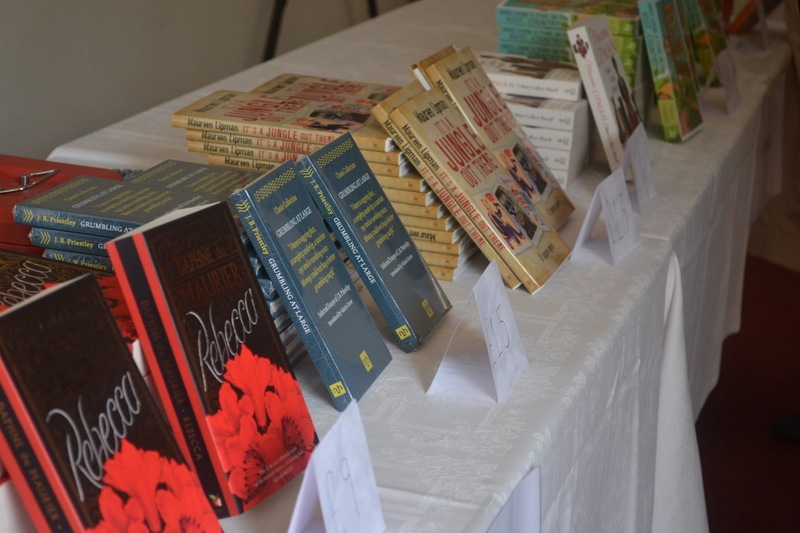 Yet again, I had a great Gibraltar Literary Festival this year. I feel so lucky that just a few minutes from my home I can go and see authors, journalists and other public figures speak about their work. Many of whom have succeeded against the odds and their stories inspire us all to never give up. Wow where do I begin? 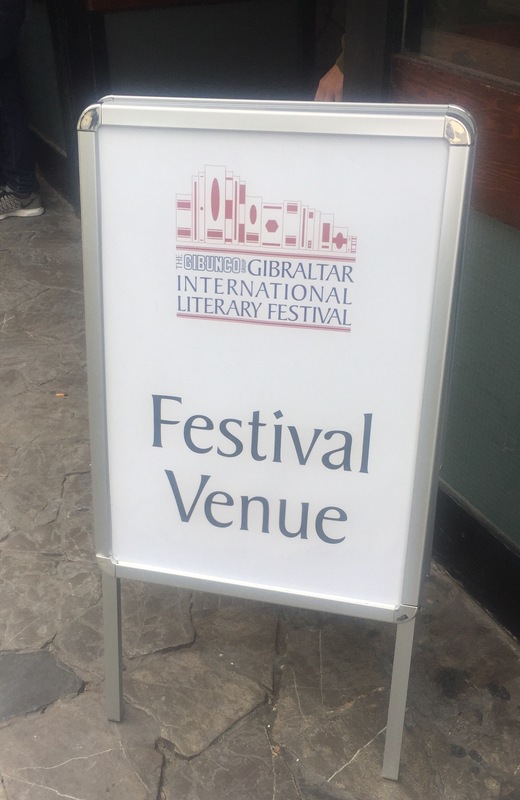 The Gibraltar Literary Festival went by in a blur for me, I managed to get to a few more talks this year but really would have liked to get to even more. It’s a time when the atmosphere of the place changes, you can wander down Main Street and see Maureen Lipman walk past or be waiting to cross the road and Nicholas Parsons pulls up in a car nearby. You can see someone and say hello to them because you think you know them, then realise they are off the telly! 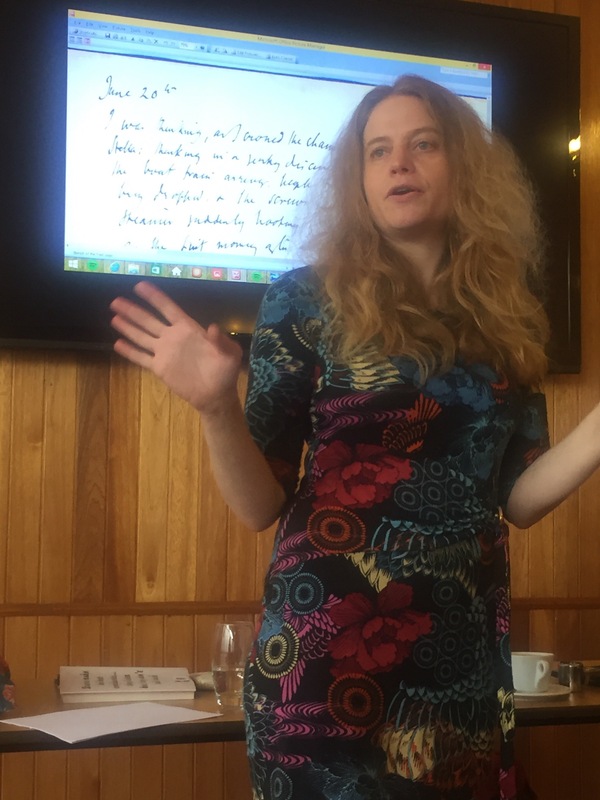 On Thursday morning I attended my first talk given by Dr Sally Bayley on the subject of diaries. With the title of The Private Life of the Diary, it was billed as “an interactive lecture on the nature and art of diary writing”. It was based on her book: The Private Life of the Diary : From Pepys to Tweets and was utterly fascinating. 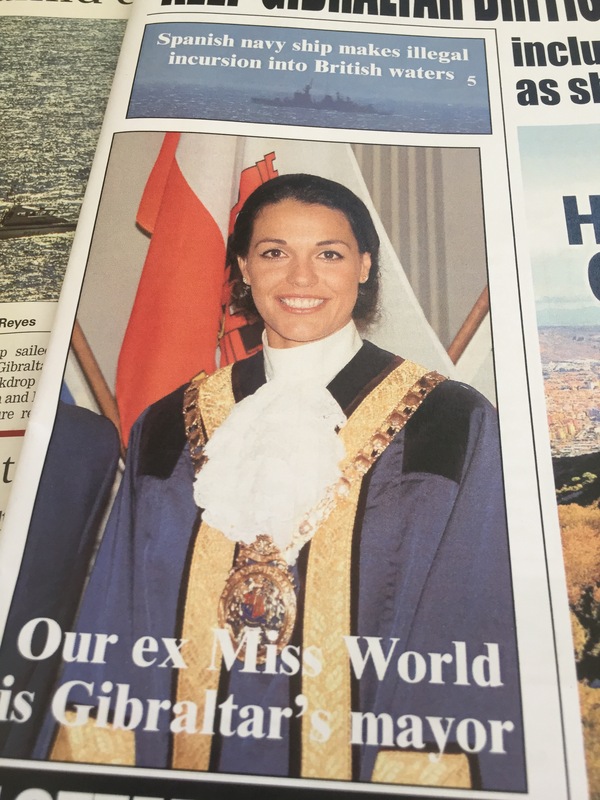 The diarists covered ranged from Samuel Pepys to Virginia Woolf, Anne Frank to Gibraltar’s own Miss World; Kaiane Aldorino. I have written an article all about this event for the Gibraltar based online parenting magazine Mum on the Rock . If you would like to read the article, please click on this link. Making the most of my time while the Little Postcards were in school, I treated myself to a second talk on Thursday. 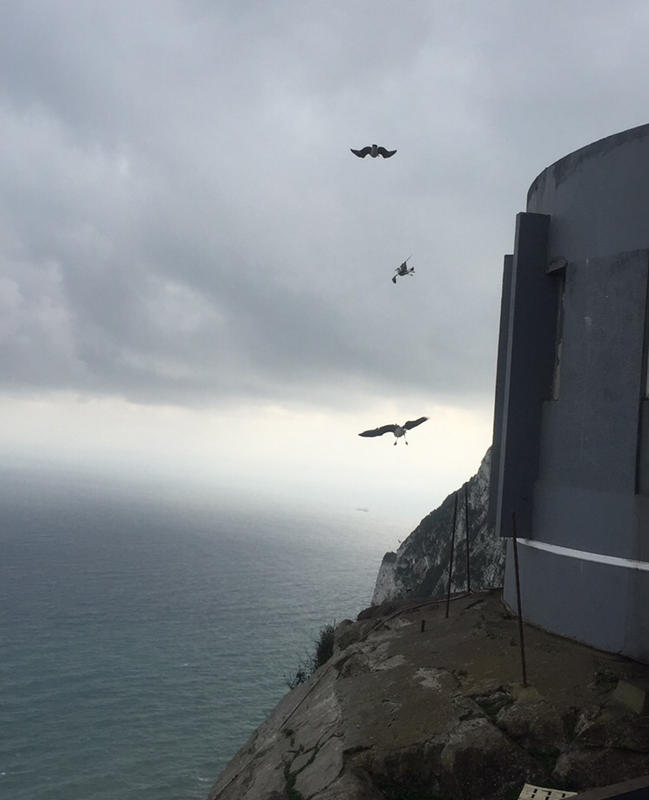 This time it was about works of literature in which the Rock of Gibraltar had featured, from Spanish and North African chroniclers in the Middle Ages to more recently, John Le Carre and Stieg Larsson. 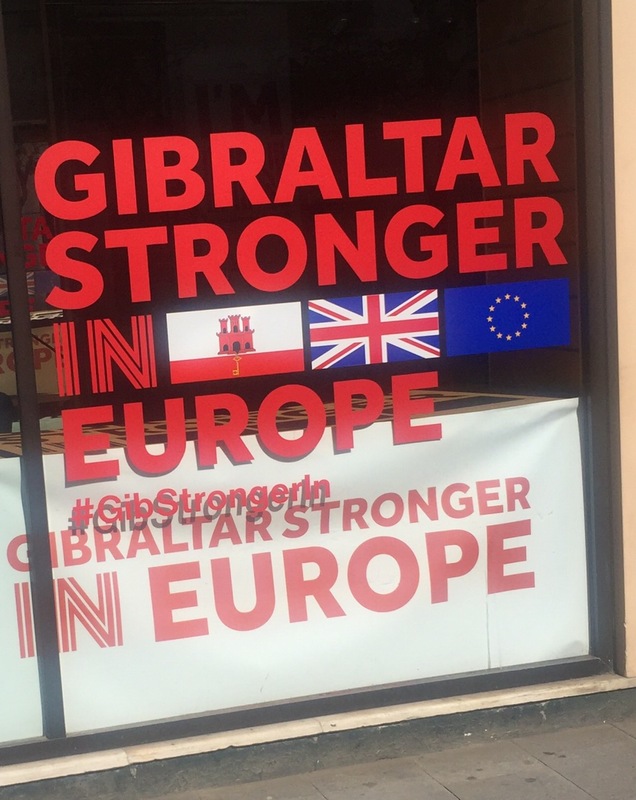 This talk was introduced by Gibraltar’s Chief Minister, Fabian Picardo who had taken time out between reshuffling his cabinet that morning and heading to Parliament later in the afternoon. 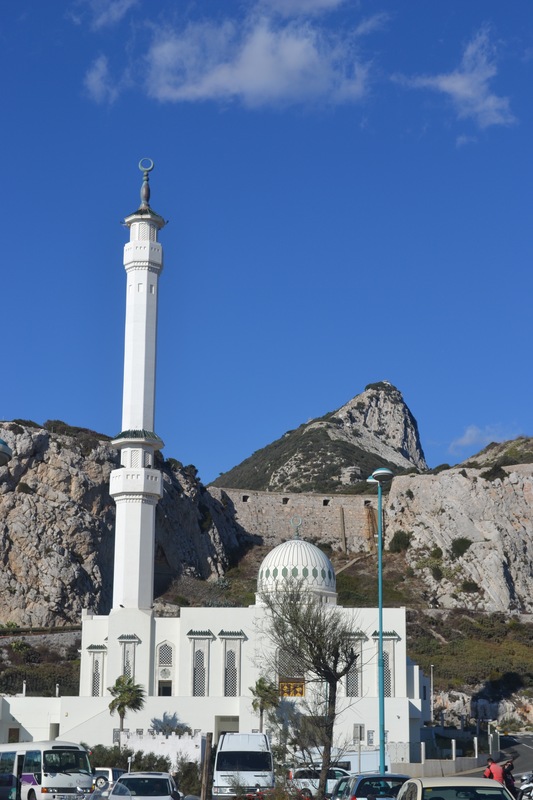 In his introduction he talked about the Convent (the Governor of Gibraltar’s residence) which was the venue for the event, and said it was a “place of stories, nuns and soldiers in equal measure, masters and servants, colonialism and emancipation”. 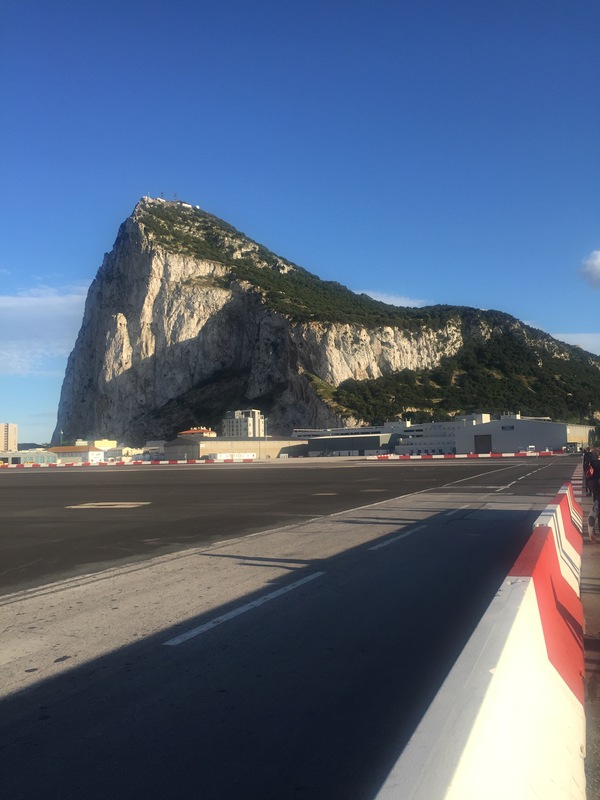 Mr Picardo expanded, saying Gibraltar “is a place where legends have been created – where stories have been spun and stories are still being written”. He went on to reference Gibraltar’s role in Stieg Larsson’s Millennium trilogy, a series which I enjoyed immensely. I remember reading the final book The Girl Who Kicked the Hornet’s Nest when we lived for a while in Queensway Quay and read to my amazement that one of the central characters, Lisbeth Salander, had visited the marina to see her solicitor. I couldn’t believe that the heroine of the book I was so immersed in should come to visit the place where I was living at that moment. At 7:00 she left the hotel and set out to buy mangos and apples. She took a taxi to the Peak and walked over to the apes. She was so early that few tourists had yet appeared, and she was practically alone with the animals. She liked Gibraltar. It was her third visit to the strange rock that housed an absurdly densely populated English town on the Mediterranean. 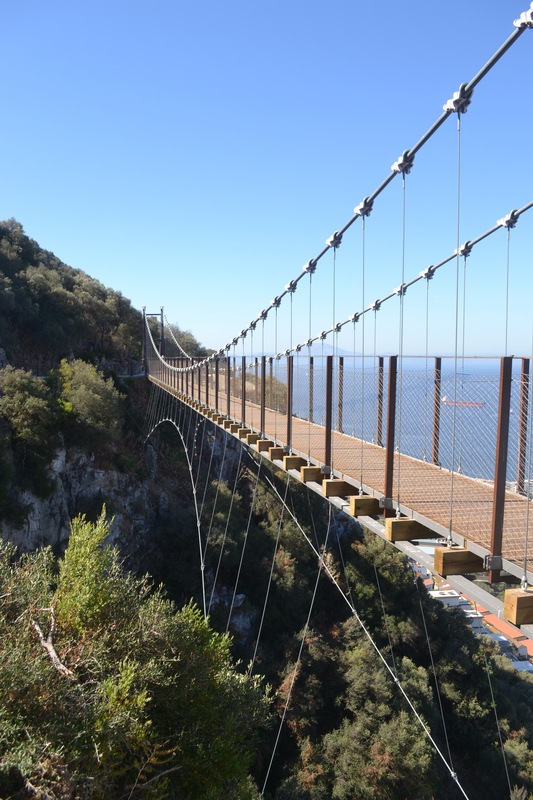 Gibraltar was a place that was not like anywhere else. The town had been isolated for decades, a colony that obstinately refused to be incorporated into Spain. The Spaniards protested the occupation, of course. (But Salander thought that the Spaniards should keep their mouths shut on that score so long as they occupied the enclave of Ceuta on Moroccan territory across the strait.) It was a place that was comically shielded from the rest of the world, consisting of a bizarre rock, about three quarters of a square mile of town and an airport that began and ended in the sea. The colony was so small that every square inch of it was used, and any expansion had to be over the sea. 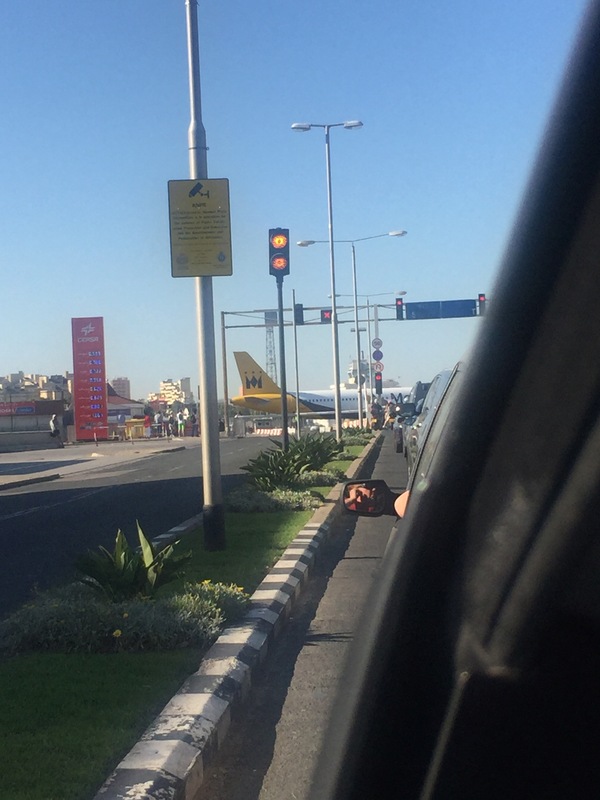 Even to get into the town visitors had to walk across the landing strip at the airport. Gibraltar gave the concept of “compact living” a whole new meaning. I’d say that’s a pretty accurate literary portrayal of Gibraltar! Friday lunchtime meant a trip to the Sunborn to see the great Just a Minute panel show. I went last year and it was so good, I was keen to get to see it again. I was particularly excited to see Pam Ayres, someone I had grown up seeing on the telly and who I find very funny. She was scheduled to speak later in the day at a time I couldn’t make so was looking forward to seeing her in this. Unfortunately she had been delayed on her way to Gibraltar and wasn’t able to attend. The BBC Radio 4 presenter Sue McGregor from Woman’s Hour and the Today programme filled in for her instead. She was very good replacement, but I was a little bit disappointed to miss Pam Ayres. A friend of mine got to see her solo talk later on and said she was brilliant and very funny. Nicolas Parsons, who had celebrated his 93rd birthday recently was on sparkling form and the rest of the panel too. Alongside him and Sue McGregor was the author and comedian Tony Hawks, actress and writer Maureen Lipman and author Felix Francis. After a very funny hour long session which saw the panel discussing subjects like champagne, Casablanca and cruise ships, Nicholas Parsons pledged his intention to return to the festival again next year. The talk named ‘The Gibraltar Book Club’ piqued my interest as I am a member of a book club and wondered how this would translate to an hour long chat with an audience rather than a cosy evening out with friends and maybe a bottle or two of wine ;-). This book club had three members, Sue MacGregor, Maureen Lipman and Tony Hawks, all of whom had chosen a book for the two other panellists to review. Maureen Lipman went first with her choice; a selection of essays by the playwright JB Priestley called ‘Grumbling at Large’. She said she’d been drawn to this book in particular as a friend of hers had put the collection together and written the foreword. Saying that when we have such busy lives it’s nice to have something to read which you can pick up and put down easily, and a collection of essays can do just that as you can read some of them in a few minutes. Essay writing is a really good way of “finding your literary voice” she added. The rest of the panel agreed that it was a good book, Sue MacGregor even gave an anecdote of the time when she had met the author. Next up was Tony Hawkes, his choice was Daphne du Maurier’s Rebecca. He decided to pick it because he’d been a regular visitor to the Daphne du Maurier Literary Festival and realised to his shame that he had never actually read any of her books. Despite the initial impression that this was a “woman’s book” he said he’d enjoyed it. He liked how the author “led you in” and changed the pace of the story from romance to a whodunit style of thriller. Maureen Lipman said she’d read it as a young woman and loved it but when she reread it recently, she was disappointed by the “wet woman” in the role of narrator. Sue MacGregor in comparison loved it and enjoyed how the “characters leapt off the page”. Finally, Sue MacGregor introduced her choice which was Naples ’44, by the travel writer and former intelligence officer Norman Lewis. A great fan of Naples herself, she told the audience that the book was written after Lewis had spent time in the city in 1944 as an intelligence officer. He recounted his experiences in a city where people were starving to death and desparately trying to survive. Maureen Lipman described it as “fabulous” and “the best type of journalism”. Tony Hawks said Lewis was a “keen observer of everything” and “clearly a compassionate man” but he didn’t reveal much about himself. In summary, the panel said they’d enjoyed the chance to read something they otherwise wouldn’t have picked up, which is definitely one of the joys of book club for me. During the festival there were a number of events especially for families, all of which were free. Last year I took the Little Postcards along to see Christopher Lloyd and his ‘Complete Plays of Shakespeare in 60 minutes‘ and they enjoyed it immensely. This time we went along to see his latest offering ‘The History of Britain in 60 Minutes‘. Christopher is a very engaging speaker and manages to hold the young audience’s attention with a series of props he produces from his cloak (not in this picture). Again this time, his talk was great as he picked up on common themes throughout British history like architecture and maritime history. He has a way of making the historical figures come alive and was very well received by both the younger and older members of the audience. 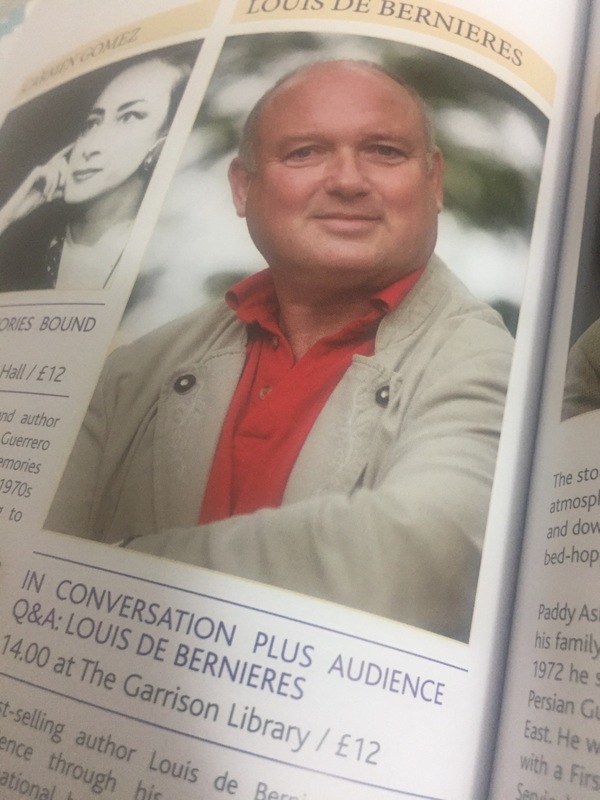 Sunday afternoon was a real highlight for me, I had arranged to go with a few of my book club friends to see the author of Captain Corelli’s Mandolin, Louis de Bernières. This hour long conversation between Louis and regular festival host, Paul Blezard was just wonderful. He read several of his poems, including one written in Spanish, and was questioned on whether he would consider rewriting the ending of Captain Corelli’s Mandolin as he was a bit dissatisfied with how it finished. “No!” was the reply to that, as it would make the book an awful lot longer! Louis also revealed that he’s being doing some research while in Gibraltar as the Rock will feature in his next book. I cannot wait to read that! If you are still with me, thank you for reading this post – it’s been an lot longer than my usual ones! There was so much to see and experience at this year’s festival. I couldn’t help noticing that a very large percentage of the audience at all the events I attended (apart from the children’s one) were around retirement age. 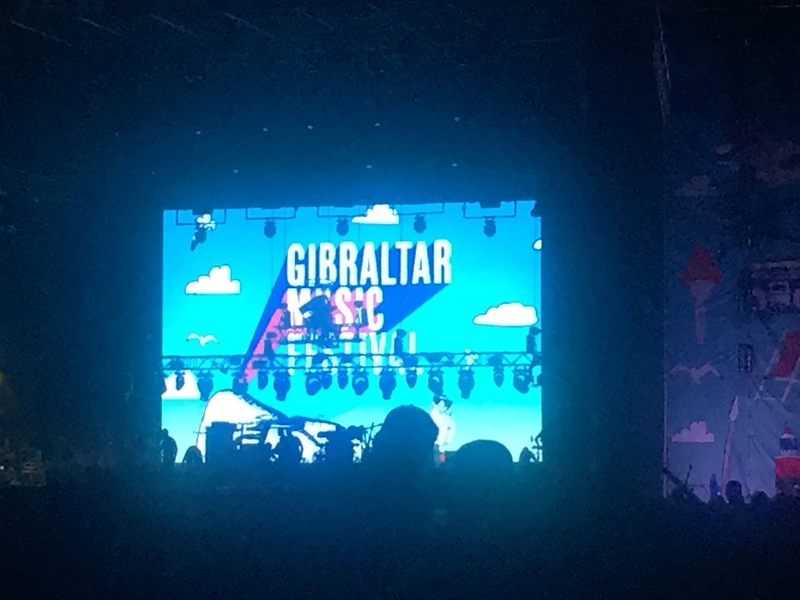 Quite a few had travelled over to Gibraltar, specifically for the festival, from Spain and the UK. How lovely to be able to spend that much time listening to wonderful speakers and expanding your mind! I loved my time at the festival, I was lucky enough to see more this year than on my previous two visits. The whole event is growing each year and while it attracts very welcome return visitors, it also brings fresh new speakers each time. 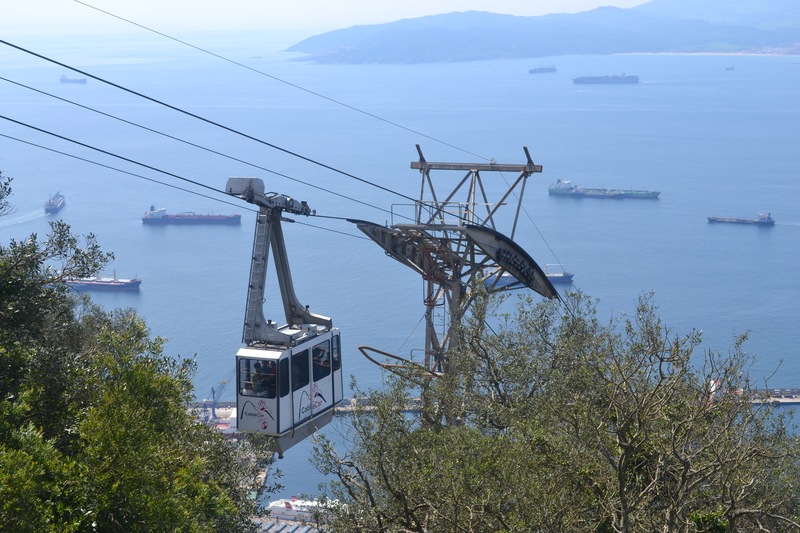 Both Nicolas Parsons and Christopher Lloyd said at their talks they’d like to return to Gibraltar next year for the fifth edition, I wonder just who else will be coming to the Rock to entertain us next time?